When a family member gets married, they form a new alliance with their spouse. This shift in family dynamic can cause tension between you and your sibling's spouse. Attempting to create a peaceful relationship with your in-law can help you maintain and even improve your relationship with your sibling. (Sibling's name) tells me you like to (insert activity or hobby). How did you first get interested in that? Holidays and other special events can be stressful, especially if you aren't sure how to deal with your in-law. If you haven't yet connected, set an obtainable goal by starting off small. Attempt to give her a genuine compliment. Spend a few minutes chatting with him. If you are not comfortable with him yet, approach him when he is standing in a group. Be courteous. If you are at a party, ask if you can get her anything to eat or a drink. If you are at a loss for what to say, remember you both have your sibling in common. Share a funny anecdote about growing up to get the conversation going. When the night is over, be sure to say goodbye before you leave and note it was nice seeing them. 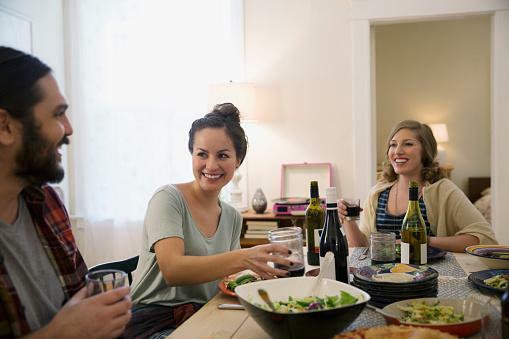 You may have some social anxiety and feel uncomfortable around new people, or your sibling's spouse may be shy and guarded. Either way, try a few tips to help you interact with him. If you are nervous, keep conversations brief. Excuse yourself if you are overwhelmed. You can say, "It was great speaking with you, I need to head out, but I look forward to seeing you again." If there is an awkward silence, ask general questions about how she met your sibling, what they do for fun together and where they are living. If you don't understand what he said, or a joke he made, ask about it. You can say, "I'm sorry, I must have missed something. What did you mean by (insert what was confusing)." If she has an opinion you don't agree with, be kind and open to her. Ask questions out of curiosity, instead of being defensive about your stance. You can also share you respect her opinion, but have a different perspective. He makes rude and lewd comments about you or your sibling regularly. She physically or emotionally violates you. Examples of this include physical harm, inappropriate sexual comments or touching, and verbal abuse. He attempts to split you and your sibling. Splitting occurs when one person pits two other people against each other. He may do so by starting arguments between you and your sibling which over time creates a rift in your relationship. She uses you for emotional support and talks poorly about your sibling to you. If the situation is safe, meaning you are not in physical or emotional danger, attempt to speak with your sibling's spouse about how you are feeling. You can say, "I felt uncomfortable when you made this comment. Going forward, please do not speak to me in that way again." Be sure to inform your sibling that you had a conversation with her spouse so everything is transparent. Hopefully, it was just a misunderstanding and you can work on your relationship in the future. If your sibling's spouse puts you in physical or emotional danger, inform your sibling that you are no longer comfortable being around her partner and briefly explain why. Make plans with just your sibling and do not enter into situations where you will be alone with her partner. If she attempts to split you and your sibling, do not engage in arguments. Let your sibling and his spouse know that you will speak with them individually if they are having a problem with your behavior or something that you said. If he uses you for emotional support, let him know that it is not appropriate for him to talk badly about your sibling with you. Redirect him to speak with his partner to resolve the issue. Do not engage with her if she is making comments that make you feel uncomfortable. Politely excuse yourself or set some boundaries. If you've tried to set boundaries in the past but he still violates them, make sure you only engage with him in a group setting, or very minimally one on one. If she tends to be abrasive or rude, try to be kind in return. It is really hard for most people to continue to behave poorly when they are not getting a reaction out of their target. If you just don't enjoy his company, spend some time making small talk with him at the beginning of your visit when you have the most energy. Once you've hit your max, remove yourself from the situation and hang out with someone else. If you know that she will be at an event, or they have invited you over for dinner, make sure you bring a friend or a partner to accompany you. Sometimes this can make the visit a little more bearable. If you don't enjoy speaking with your sibling's partner, try to make sure that when you do spend time together you are engaging in an activity instead of a sit-down meal. This can limit conversations while still allowing you to spend time with your sibling. If you and your sibling's spouse got off to a rocky start, or you don't know him well yet, take your time and know that you will find some ways to connect eventually. In anything that you do, remember to be kind and genuine. As long as the partner is safe to be around, give this person a fair chance because he or she may be in your life for a while.